Degree on Performing Arts at Upper Drama School of Murcia, Spain and Specialist on Museology and Contemporary Art at University of Alicante, Spain. As a performance artist he has developed his work in public spaces, art centers and festivals in several cities in Europe and Africa. Since 2009 he leads “Abierto de Acción” association for research, development and diffusion of performance art through festivals, meetings and workshops. His performances are developed joining two perspec- tives, the socio-political and the private. These are strongly marked by a natural and emotional action, making those who accompany him in his proposals feel and think alongside. With minimal resources, his performances take us to a world of existence and denunciation of moments or decontextualized acts which lack of social parapherna- lia. These moments are stripped from its justified injustice and therefore remain in their pure state, intimate, cruel or grotesque. Bachelor in Fine Arts, Valencia Polytechnic University. Valencia, Erasmus Scholarship in Athens, Valencia Polytechnic University Scholarship in La Habana and Master in Art Production and Re- search in Granada University. Her work has evolved from photography and video to performan- ce art, the discipline she has almost exclusively been dedicated to since 2007. She is highly experienced in creating, coordinating and organizing groups, events and activities related to action art and culture, such us “Hatajo Group” (now Enclave de Acción) and the production of the International Festival of Performance Art Ca- bezabajo held in Granada in June 2011. She has taken part in numerous performance festivals and events, such us,Abierto de Acción (Jaén, 2013, Murcia 2011), Artón (2012, 2011), PoesiAcción! (Instituto Cervantes de Berlín, 2011), Festival Cabezabajo (Granada, 2011), NauEstruch (Barcelona, 2010), Art d ́acció (Valencia, 2010), Acción!MAD09 (Madrid, 2011, 2009), Influxus I y II (Museo Vostell Malpartida, Cáceres, 2007 and 2009), La Muga Caula 4 and 5 (Girona, 2008 and 2009), Sinergia (Girona, 2008) and Radio de Acción (Huelva, 2008). 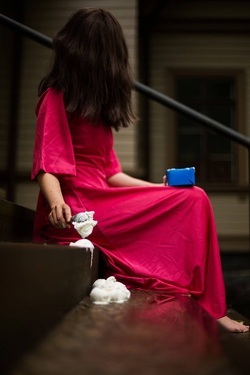 She is developing a research project on the teaching of performance art, as she combines her artistic and management work with teaching and giving workshops at various centres and institutions. Isabel conceives artistic creation as an act closely linked to life, so that her works need, inexorably, be sincere and connected to her feelings, thoughts and deepest emotions. She is interested in performance art because its interaction with the public and how it contributes for the work to exist, making them the protagonist of her performances. Her work is austere in terms of techniques and materials needs. Often, her performances are displayed as games, challenges or experiments. She works with performance, photo, video, drawings and installtions. Has been exposed in museums, galleries and alternative spaces, both at national and international level being last solo exhibitions with a residency at Espace o25rjj, France (Oct 2012) and Espace b, Madrid (April 2013). At both with her work in progress “The Feather Collector”. Her performances has travel around Europe, Mexico and Japan. At festivals as Interajcke (Poland), Preavis (France), Accion!MAD (Spain), Bbeyond (Irland), among others. In her experience as art managing projects underline: ELCarromato (2006/10), ARTóN(since 2009) and MATSU (2012), a space dedicated to contemporary creation and EXCHANGE project with Isabel León. My work is made up of investigations in personal worries on the subjects of time and identity in our society. For this purpose I use all available tools and elements I found on my way. The first being my own body, the one that follows me at all times and through which I think and feel the world. I am interested in working wiht various medias because each of them makes me observe what surrounds me in a different way. Reality becomes lines through drawing, the light and its power to transform with photography and trough performance and openness to the world. In my actions is usually presents the resistance, the irony, the intensity and the silence. (London); Ha ́penny Birdge (Dublín), and in Preavis de desordre Urbain in Marseille, Exchange in Oslo, Fine Arts San Carlos University at Valencia. Creating events and featuring for FNAC, Casa de las Culturas, Renoir (Porches del Audiorama), IAF/ Zaragoza Activa, CERAI and for The Bid of Saragossa European Culture City in 2016. He was chosen by EU to paint murals in Youth on the Move EU Project and AULA FAIR in IFEMA –Madrid-. He does creative and art workshops in different places. More than 40 solo and collective exhibitions on display with his work. As well I was presenter of the International Film Festival ECOZINE, Slam Poetry ZGZ, 22xD. Luis Calanda Film Festival, Recycled Planet Film. Currently he is playing the Performance-Show “Cold Meat” in Theatres. Franzisca Siegrist was born in Switzerland, and raised in Spain. She studied fine arts at the University of La Laguna and the Polytechnic University in Valencia where she studied performance art with Bartolomé Ferrando and got her postgraduate degree in art. 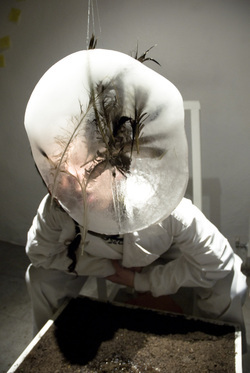 She works with objects, installations, performance art, video and photography (documentation). She is also co-founder and chair of the artist run initiative PAO – Performance Art Oslo, and has shown her work in several European countries, in Asia and in USA. Nowadays she lives and continues her work in Oslo, Norway. In performance art I have found an extended way of developing ideas, having the possibility to related also to other art disciplines, such as sculpture, video, photography (documentation) or installation. Creating in this interdisciplinary way gives me the opportunity to seek the possibilities of my body and observe its relation with time and space. Usually they are simple objects from everyday life I use to create pieces, transforming their use, taking them out of their regular context and giving them a new meaning. The topics can vary, but are always connected to every day and social life. The result of my works ranges between absurd and poetical images, and are often site specific works. Inger-Reidun Olsen (iRo) holds a BA in choreography from Academy of Dance, National Academy of Arts and a two year degree from 1-year Pre-study dance program in Oslo (which today is School of Contemporary Dance). Since 2003 she have been doing her own artistic projects and performances as well as participated in other collaborative projects both as a choreographer, dancer and performer. iRo ` s artistic work moves at the intersection of contemporary dance and performance art and involves performative work in traditional theaters, black boxes, galleries, in public spaces, in the forest, on the screen, happenings, in lectures, teaching, mentoring and curating. Her background as a dancer gives a strong physical presence in her performative and theatrical work. Her visual approach is visible in how she relates and creates in different spaces by using the body, materials and lights to communicate topics of her interests. Her work have been presented in United States , China , Mexico, Spain, Sweden and Norway. Susanne works as a theatre maker in the companies LIVESTOCK and Happy Gorilla Dance Company, but also embark on missions as a performance artist and freelance scenographer. She has her early education in visual arts and a BA in scenography from Norwegian Theatre Academy and her main interest lies in the intersections between performance art and theatre strategies and the collective process of creation. Born in Norway. Ida Grimsgaard got her B.A. in scenography at Norwegian Theatre Academy in Fredrikstad, Norway. With a back- ground from fine art she has exhibited and performed her work at different festivals around Europe. Ida is based in Oslo, Norway. She’s exploring the coincidences that appear by being present. Investigating the possibility in animating different objects/materials. An attempt to transform the physical present from the human into an object. Working with materials either as the performer itself, or as costume – a part of the performer. The body and its physicality is the starting point of her work.